:summary: This article describes step by step how to set up jobs with GitLab_'s continuous integration (CI) tools for building and deploying a static website generated with Pelican_. The source of the website needs to be hosted (publicly or privately) on `GitLab <https://gitlab.com/scheunemann/website>`__. As an example, this page is the result of the `current master`_. For each change on a remote branch on GitLab, the website gets build as a test. If there is a change on the branch "master", an additional job deploys the website to an external web server using the file transfer protocol (FTP). This article describes step by step how to set up jobs with GitLab_'s continuous integration (CI) tools for building and deploying a static website generated with Pelican_. 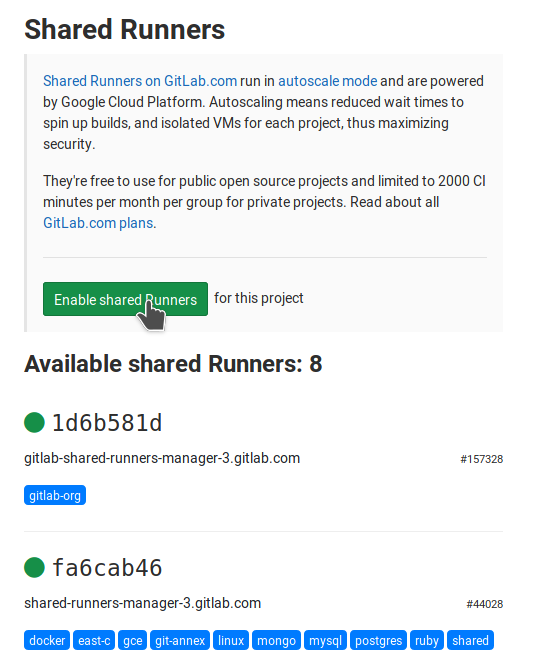 The source of the website needs to be hosted (publicly or privately) on `GitLab <https://gitlab.com/scheunemann/website>`__. As an example, this page is the result of the `current master`_ branch. The full script as described below can be found in my website repository: `.gitlab-ci.yml`_. - all used python modules should be mentioned by a `requirements file <https://pip.readthedocs.io/en/1.1/requirements.html>`_ placed in the root directory of the repository (It is called requirements.txt_ for this project). We create a file called :code:`.gitlab-ci.yml` in the root directory of the repository. It describes the jobs executed by the runner on changes in a branch in the remote repository (hosted on GitLab). The file :code:`.gitlab-ci.yml` starts with defining a docker image. I chose the latest Ubuntu image :code:`ubuntu:latest` just because of Ubuntu's popularity. We define a job :code:`build website` for building the pelican site. If the site gets build without errors, the job is successful. The line :code:`stage: build` is optional. You can already merge all three sections into one YAML file called :code:`.gitlab-ci.yml`, add it to your root of your project and push it to the remote repository on GitLab. The output under **CI/CD ➔ Pipelines** will look like the following, with the job :code:`build website` still running. If we change the master branch, the same job :code:`build website` gets triggered. In addition, I want to deploy the web site to an external web server if the job :code:`build website` was successful. The additional job is called :code:`deploy website`. The commit and the job execution is shown in commit `32e8161e <https://gitlab.com/scheunemann/website/commit/32e8161e45b95751fbfbf7acd2db89e10418c93d>`_. Although both jobs are part of the `.gitlab-ci.yml`_, only one has been triggered as we pushed to the branch "article-auto-deploy" (i.e., not to the branch "master"). :alt: All three commits and the triggered jobs. :alt: Setting up environment variables to use in ".gitlab-ci.yml" script. I made those variables only accessible to my protected branch master. Otherwise, everybody with access to another branch might be able to adapt the YAML file and retrieve my FTP password with putting :code:`echo $FTP_PASS` one of the jobs.